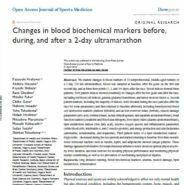 We studied changes in blood markers of 18 nonprofessional, middle-aged runners of a 2-day, 130 km ultramarathon. Blood was sampled at baseline, after the goals on the first and second day, and at three time points (1, 3, and 5/6 days) after the race. Blood indices showed three patterns. First pattern indices showed essentially no changes after the two goals and after the race, including red blood cell indices, gamma-glutamyl transferase, and tumor necrosis factor-α. Second pattern markers, including the majority of indices, were elevated during the race (and also after the race for some parameters) and then returned to baseline afterward, including hemolysis/red blood cell destruction markers (indirect bilirubin) and an iron reservoir index (ferritin), muscle damage parameters (uric acid, creatine kinase, lactate dehydrogenase, and aspartate aminotransferase), renal function markers (creatinine and blood urea nitrogen), liver injury index (alanine aminotransferase), lipid metabolism indices (free fatty acid), reactive oxygen species and inflammation parameters (white blood cells, interleukin-6, and C-reactive protein), and energy production and catecholamines (adrenaline, noradrenaline, and dopamine). Third pattern index of a lipid metabolism marker – triglyceride – decreased during the race periods and started returning to baseline from then onward. Some hormonal markers such as insulin, leptin, and adiponectin showed unique patterns. These findings appeared informative for nonprofessional athletes to know about an optimal physical activity level, duration, and total exercise for elevating physical performance and monitoring physical/mental conditioning as well as for prevention of overtraining and physical injuries.